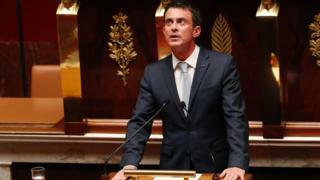 Image caption Prime Minister Manuel Valls said France had to "learn to live with this menace"
France's National Assembly has voted to extend the state of emergency for six months. The move follows last week's attack in Nice in which 84 people were killed and scores injured when a lorry was driven into crowds. "Even if these words are hard to say, it's my duty to do so," he said. "There will be other attacks and there will be other innocent people killed. We must not become accustomed, we must never become accustomed, to the horror, but we must learn to live with this menace." The extension agreed in the early hours of Wednesday would take the state of emergency until the end of January 2017. It is the fourth extension France's parliament has proposed and the move must be approved by the Senate. Earlier this month, President Francois Hollande said he did not intend to extend the state of emergency beyond 26 July. The last extension was to cover the Euro 2016 football tournament and the end of the Tour de France cycling race. A recent commission of inquiry found that the state of emergency was only having a "limited impact" on improving security. It questioned the deployment of between 6,000 and 7,000 soldiers to protect schools, synagogues, department stores and other sensitive sites.